I am aware the present head of Punjab Congress is Mr. Partap Singh Bajwa is himself also a Jatt. He is of the few Congress leaders who can feel the pulse of masses. We talked to hundreds of his voters to know what is his secret of this vote catcher. He is master in building very very personal relations with the voters. Will he be able to apply the same principle to the politicians themselves he is now suppose to lead, only time will tell us. Any way as a politician he can perhaps steep to any low and this is what he demonstrated recently. Income Tax Deptt. came out with a novel idea of amassing taxes i.e catching the rich farmers whose land is being diversified for urbanization. This was really a great issue which would have accelerated formation of Khalistan and it was also likely the farmers of the neighbouring states would have also joined the Punjabi Jat. P.S. Badal India’s faithful soldier and shrewd politician felt the importance of this issue of wealth tax and was taking up with the concerned central ministry. When Bajwa understood the potentials of the issue and that it was possible that Centre could bow to their demand Bajwa hijacked the issue from Badal and approach minister taking help of Haryana CM. Congress being the ruling party and naturally they succeeded. Badal was thus politically humbled. 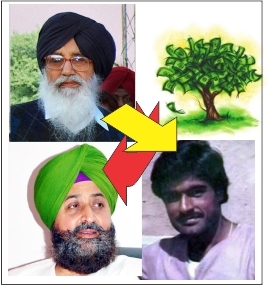 Sarbjit’s murder in Pakistan jail provided an opportunity to Badal. Sarbjit ‘s opportunist sister was blaming Central leaders for failure. Badal knew the hunger of sister and immediately rushed his envoys to Dalbir. The shrewd Badal knew money can make the mare go. He announced Rs. one crore against Congress’s 20 lakh. Also the money is to go to Sarbjit’s daughters while their Bhua i.e Dalbir is politically leading the Sarbjit’s campaign. As far as Sarbjit issue is concerned he has not only neutralized Dalbir rather scored above the Congress. I think Bajwa of Congress should learn a lesson from this incidence. It is popular saying in Punjab that a Jatt is a worst daai i.e opportunist of the first order. So Bajwa will be no match for Badal’s daa. No doubt Bajwa is also Jatt but he need to consult many before he decides a thing where in Akali Dal the Jatt is all in all.